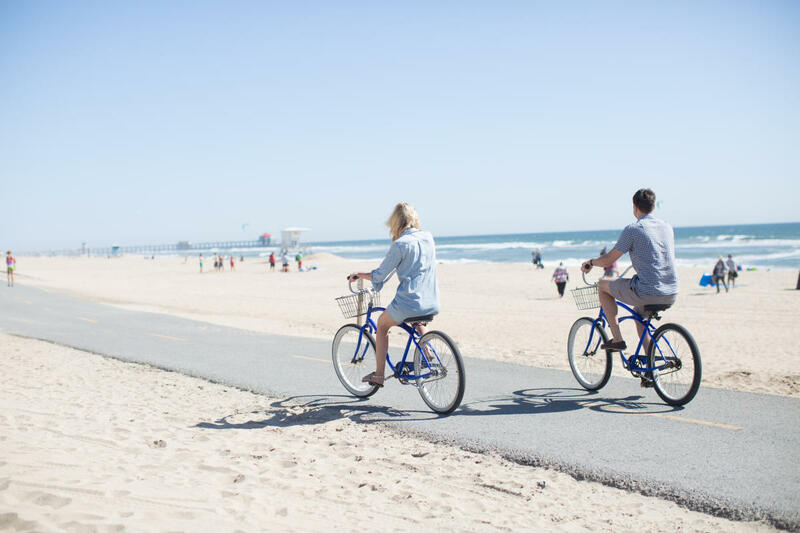 With our 10 miles of uninterrupted coastline, consistent sunny skies, and charming seaside downtown, Huntington Beach has perfected the surfer cool meets coastal chic lifestyle. Just like our summer, our lineup of fun is endless. Every day visitors and locals alike embrace their inner beach lover by sinking their toes into the sand, surfing the epic swell, spiking a volleyball, strolling the iconic pier, and gathering around a beach bonfire—and they have their choice of five dreamy beaches, all connected by a 10-mile paved beach path ideal for walks, jogs, and bicycle rides. There’s even a mile-long stretch of sand dedicated to dogs in our famously pooch-friendly town. Surf City USA is everything you want in a getaway. Yes, you specifically. Because whatever you enjoy—strolling the beach, exploring the shops, enjoying nature, fine dining or a vibrant nightlife, it’s all here. Have something specific in mind? Check out our itineraries and build your Surf City USA adventure. Huntington Beach’s historic Main Street and newly minted Pacific City—an oceanfront dining, shopping, and entertainment hub—offer a delicate mix of mom-and-pop bistros and sophisticated palettes, surf shops and chic boutiques, art galleries and live music, and so much more. Sipping local craft beer and signature cocktails by the sea has never been so rewarding. Reconnecting with nature happens on—and off—the sand in Surf City USA. Our lush 365-acre Huntington Central Park offers walking paths, horseback riding, a sports complex, a disc golf course, and the immersive Shipley Nature Center. Our city’s longstanding commitment to the environment shines through the restored Bolsa Chica Ecological Reserve and Huntington Beach Wetlands, some of Southern California’s most vital areas housing more than 300 bird species. While coastal crusaders love to play, they also love to pamper. Luxury spa experiences, walk-in foot massages, and refreshing wraps await after a long day of fun in the sun. Day trips to Southern California’s top family-friendly attractions, like Disneyland and the San Diego Zoo, are made easy by Huntington Beach’s prime hub location—and we’ve even taken the liberty of curating a few fantastic itineraries for you.